There is the feeling that comes when you open the first few pages of a book, a desire for connection, intimacy. Amidst a world of assaultive numbers of opinions, testimony, information, this yearning is even stronger. 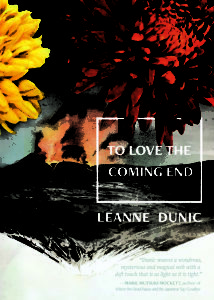 It was with such a hunger that I opened To Love the Coming End, the latest offering from Chin Music Press. The book did not disappoint. A lyric novel, a symphony in poetic prose, the work resides in the interstices of poetry and fiction and from this opening, traverses the fragile physiology of bonds and their ruptures. The author, Leanne Dunic, begins her book with an arrival at the Singapore airport and ends it many months before with the Tōhoku earthquake and tsunami, with the parting of lovers (the number 11 “Posed together and apart, forever parallel”). Singapore is humid and crowded, “flesh liquefying to sugary slush.” The narrator had landed and too she is always somewhere else, another island, another time, longing and regret threading throughout, like the number 11, a curse that cannot be escaped. Traveling through space, through time — the ways in which are always both here and not — are the stratums of Dunic’s poetics. And too there is the trouble of bodies, how they always demand, flail, ignite. Pain in my skull is equatorial. Wake with vessels broken in my ear. No cocaine, but heart palpitations. The body presences the disastrous ruptures, romantic loss, past and future natural and human-made catastrophe, our inexplicable capacity for survival. And Dunic’s writing is equally embodied: wet and lush, oily and protuberant. The poems move between Singapore, Japan, and British Columbia. And throughout this movement, there is the damage to the narrator’s body, her tendons and teeth. Her physical discomfort mirrors a deeper one, the planet is equally distressed. It is the complexity of body and its aperceptions — its fragility in the face of individuated suffering and its endurance in response to wide scale catastrophe — that creates such intimacy in Dunic’s writing. It is the simultaneity of her imagination that keeps us enraptured. No sooner have we landed with the narrator in the damp tropical heat of Singapore during monsoon season than we are whisked to another island, the site of the book’s hypothetical film, more than three thousand miles to the north. Fijisan is ready to blow. And it’s here, in Japan, that we find the narrator’s lost love, the other 1, the ‘apart and parallel’ piece of the numeric puzzle. This Japan is pedestrian and epic, lyric and prosaic, like so much of the book. It is the juxtaposition of these elements that is the majesty of Dunic’s work. A body in Singapore, a heart somewhere in between Japan and memory, a film that has never been made, and the shadow of one of this century’s most horrific natural disasters. On March 11, 2011, a nine plus magnitude undersea earthquake — the most powerful to hit Japan and the fourth most powerful ever recorded in the world — triggered a powerful tsunami. The force of the quake moved Honshu, the main island of Japan, eight feet to the east and shifted the earth on its axis. It is estimated that nearly 16,000 peopled died, not to mention the injured, missing, and displaced. The tsunami also precipitated nuclear accidents, primarily the meltdown of reactors at the Fukushima Power Plant, the effects of which still have deleterious impact on the health of the current generation and will likely endanger the next. This disaster continuously ruptures the already fragmented narrative; it dislocates the narrator and disrupts her connections to others. She is residing in the always already state of catastrophe, simultaneously unimaginable and incessantly terrorizing. In Maurice Blanchot’s words, “The disaster ruins everything, all the while leaving everything intact.” The narrator experiences this geologic devastation in ongoing aftershocks. And yet these aftershocks are of magnitudes far below the magnitude of the loss of the other 1, the other one. The loss of intimacy being more horrendous than the devastations of thousands because it occurs at a level of experience that can be felt, embodied, grieved. tried to give you attention without possession. the subject. I studied you, no longer the root. To Love the Coming End moves between these states of apprehension and incomprehensibility. All the while the language that gives them rise is both pedestrian and sensuous, languid and precise. The book is a reminder of the acuteness and messiness of being. Aja Couchois Duncan is a Bay Area educator, writer and river spirit of Ojibwe, French and Scottish descent. Her most recent book, Restless Continent (Litmus Press) was selected by Entropy Magazine as one of the best poetry collections of 2016 and the California Book Award for Poetry in 2017. She holds an MFA in Creative Writing from San Francisco State University and a variety of other degrees and credentials to certify her as human. Great Spirit knew it all along. You can also help by donating.